Development Cup 2018 in Fussen, Germany the Macedonian national ice hockey team became champs. 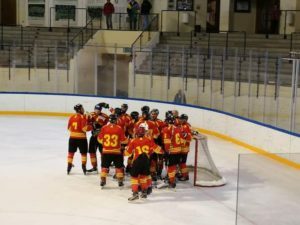 As an underdog at the start of the tournament, Macedonia playing in there first official international tournament, the Macedonians showed to be tough opponents on the ice, finishing in first place after the preliminary round with three wins and no defeats. The favorites Ireland were beaten in the first game with a 9: 6 victory. Macedonia then played Andorra who were outclassed by a final score of 9: 4. In the last game of the preliminary round Macedonia played Portugal, who like Macedonia won all the games up to this point. So it was the decider game for first place in the preliminary round. In a thrilling and high-class match Macedonia prevailed 5: 4, and won the preliminary round. After the preliminary round Macedonia went into the play-off semi-final as first placed played last place Andorra. The Andorrans were much more tougher in the semi final, but Macedonia secured a 6: 3 victory and entry into the gold medal game. Portugal who were bronze medalist in 2017 tournament and who clearly prevailed against Ireland in the semi final round took on the upstart Macedonians, but it was Macedonia who took the upper hand in the first period and never looked back defeating their opponents 12:3 and taking home the Gold.